Adele Cosgrove-Bray is a writer, poet, and artist who lives on the Wirral peninsula in England. Walk into any art shop anywhere in the world, or browse online, and you will be confronted with an enticing array of products. The temptation to buy one of everything can seduce many a newbie. After all, every shop needs customers to hand over cash in exchange for wares - that's how businesses remain afloat! Buying fancy tools of the trade won't improve your skills as an artist. This comes through diligent practice sustained over time, and a thorough understanding of what makes a painting work. However, the process of learning and experimentation is all part of the fun - and there's plenty of fun to be had as you engage on your own, individualistic journey in art. While there are a few items of equipment that you can hardly start without, taking up watercolour painting need not prove expensive. This article aims to help save you money by offering advice on selecting only what you will actually need to get you started with this deeply satisfying path of creativity. Which Watercolour Brushes Should I Buy? There is a humungous range of watercolour brushes available to buy. Huge brushes, tiny brushes, round ones, flat ones, fan-shaped ones, fish-tailed shaped ones - the choice of brushes is seemingly endless. You can choose between natural fibres and synthetic, and many 'how to' books still erroneously insist that Kolinsky sable brushes are an absolute necessity for the creation of quality watercolour paintings. Aside from the ethical issues around the use of animal fur, sable brushes tend to be far higher in price than perfectly good synthetic brushes. Buying absolutely cheap brushes, those which cost around £2 for a set, are usually a false economy, however. They may be fine for children to daub poster paints with, but they're useless for artists. The bristles fall out of the ferule, spoiling your work, and the bristles will soon loose their original shape to become a spikey, bedraggled mess. Having written that, I recently bought a cheap synthetic set of twelve unbranded, synthetic brushes for £6 and they're a pleasure to use. The three brushes shown in the photo above are all made by Royal & Langnickel. I've used these brushes continuously for the last two years and they're still in excellent condition. The flat brush is a #10 from their Essentials range, and the round brush is a #6 from that same range. The small rigger is a #10/0 from their Zen range. These three brush shapes offer bags of flexibility to enable you to create, with practice, any style of watercolour painting and will be enough to get a person started. The flat brush is used to create washes, trees and sharp lines, (which could be a fence post, a yacht's mast, a farm gate, for example). The round brush is incredibly versatile; I use it frequently for skies, foliage, textures and so much more besides. The rigger is used for fine lines where more movement is required, such as tree branches, flower stamens or a ship's rigging, (which is how it got its name). Yes, I do own other brushes, and no doubt other artists will leap to dispute my suggestions or to list their own favourites in the Comments section below. That's perfectly ok and welcome. The aim here is just to get a person started, and I use these three brushes far more than any others. Which Watercolour Paper Should I Buy? Rough, which is cold pressed but with a rougher texture. Paper can be machine-made or handmade. Watercolour paper comes in different sizes and weights. Lighter weights tend to be cheaper to buy, their downfall being their tendency to wrinkle and buckle once wet. This can be prevented by stretching paper. To do this, soak the sheet of paper in water for a couple of minutes, lay it flat on your drawing board and hold it in place with gum strip. Let it dry thoroughly before use. The choice between Smooth, Not and Rough papers is an entirely personal one. The only way to discover which you prefer is to buy a small quantity of each and experiment. However, keep in mind that different brands of paper can differ significantly, not only in quality but in how watercolour paint reacts on that paper. If you buy paper in sketchpad form and then discover you don't like painting on that particular kind of paper, you can always just use it purely as a sketchpad. Watercolour paper which weighs 140lbs or 300gsm, or heavier, will not need to be stretched before use. I recommend using paper of this weight. Very cheap paper can be a false economy. Cheaper papers easily lose surface quality when worked on. I've bought cheaper paper only to quickly demote it to sketching paper after I was disappointed by its poor performance. It can be frustrating to produce a painting which pleases you, only to find that the paper surface has started to break up in patches. I've learned to resist falling for the temptation of 'bargains'! Brands which I recommend are Arches, Bockingford and Seabright, which are all machine-made. Recently, I've also been experimenting with handmade paper from India, brand-named Khadi, which reacts quite differently with watercolour paints than the other brands listed here, and creates lovely textures and is a pleasure to use. Watercolour paper is sold either in loose sheets or in pads. The choice between these is largely a matter of preference, and this is something a person can only arrive at through experimentation. Packs of loose sheets can vary in quantity, such as 10 sheets, 20 sheets or 100 sheets or more. It can be cheaper to buy in bulk, but consider how you're going to store it if space is limited. 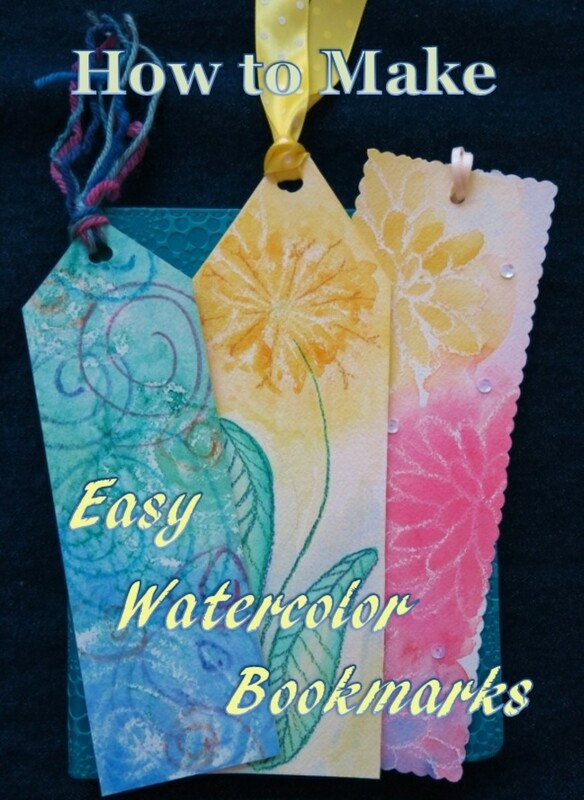 Many people prefer pads for outdoor painting, (or plein air painting, as it is often known). The firm support of a pad makes carrying a drawing board unnecessary. Also, the sheets can't get swept away on a breeze. Pads are easy to carry around, whereas individual sheets need more protection from being bent or crushed. Pads are available in seemingly infinite shapes and sizes. Some are small enough to slip easily into a pocket, which I find useful when sketching outdoors as it reduces the amount of kit I need to carry. Which Watercolour Paints Should I Buy? Watercolour paints come either in tubes or pans. Here, 'pan' means a small block of firm paint, and these come in two sizes - whole pans or half pans. Neither type is better than the other. Some artists prefer tubes, others prefer pans. Many artists use a mixture of both. The colours are the same for either type. I prefer pans as they fit into a purpose-made tray, which is convenient for carrying around. 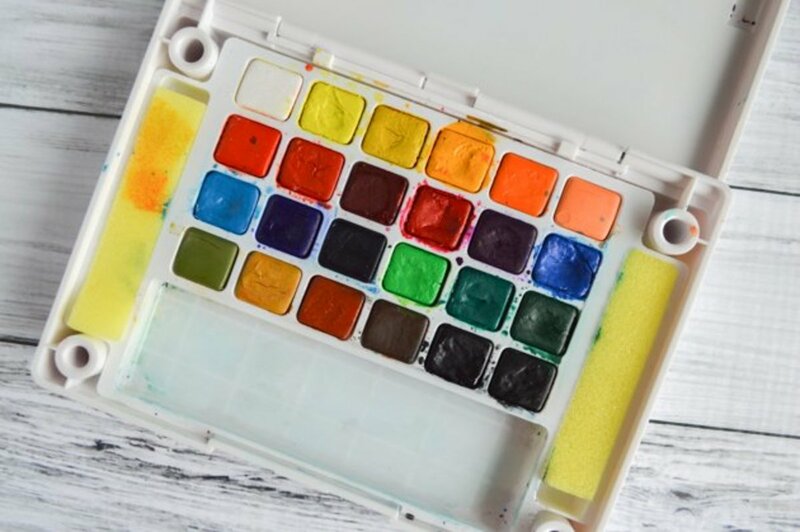 Each individual pan of paints comes in its own wrapper, and once unwrapped should be sat inside a little plastic holder to prevent neighbouring colours bleeding into it too much. There are many watercolour sets available to buy. The only problem with sets is that they tend to contain colours which you don't really need or possibly won't ever even use. Also, a large set with lots of colours can slow down the learning process by offering too much choice, so that the student tries to skip over learning how to mix colours for themselves. 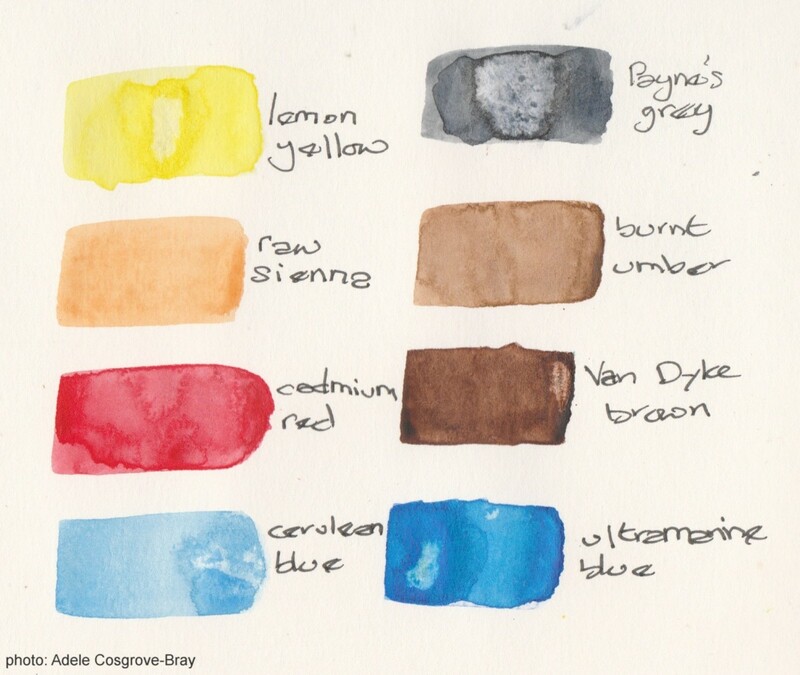 The photo above shows the eight colours which, in my opinion, are all anyone needs to get started painting in watercolours. Arguably you could get away with just seven, by removing the burnt umber and by using the Van Dyke brown in a very dilute state with a dash of Payne's grey added. You will notice there are no greens, purples or oranges. All these can be mixed from the colours shows above, and in a seemingly endless range of shades. Yellow + blue in varying quantities = greens. Red + blue in varying quantities = purples/lilacs. Yellow + red in varying quantities = oranges. 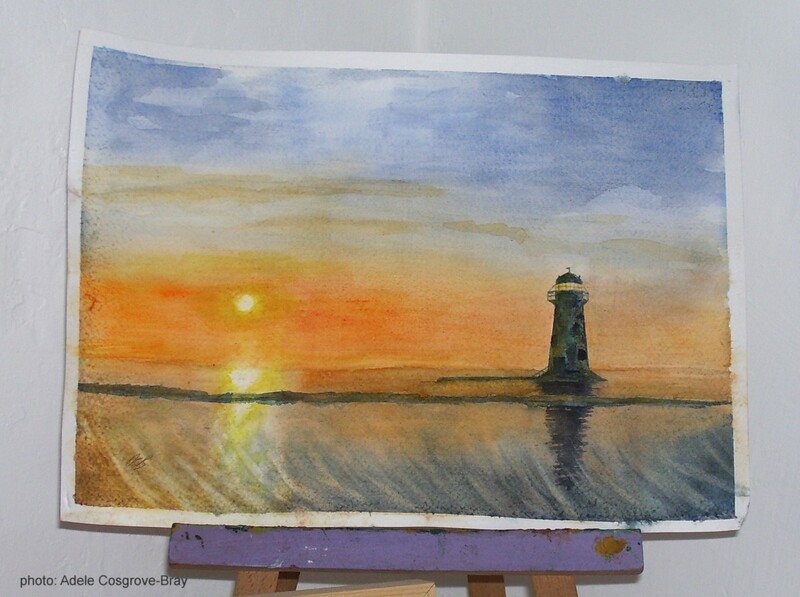 Experiment by mixing your own shades - using a cheap paper is absolutely fine for learning projects like this. I've found ready-made greens are pretty awful anyway, so much so that I've stopped using them. You will also notice that my suggested choice contains no black. I've found Payne's grey to be much more versatile, offering a far broader range of tones than a heavy black which rarely appears in nature. It is perfectly ok to have more ready-made colours than listed here! Most artists collect a much bigger variety over time. 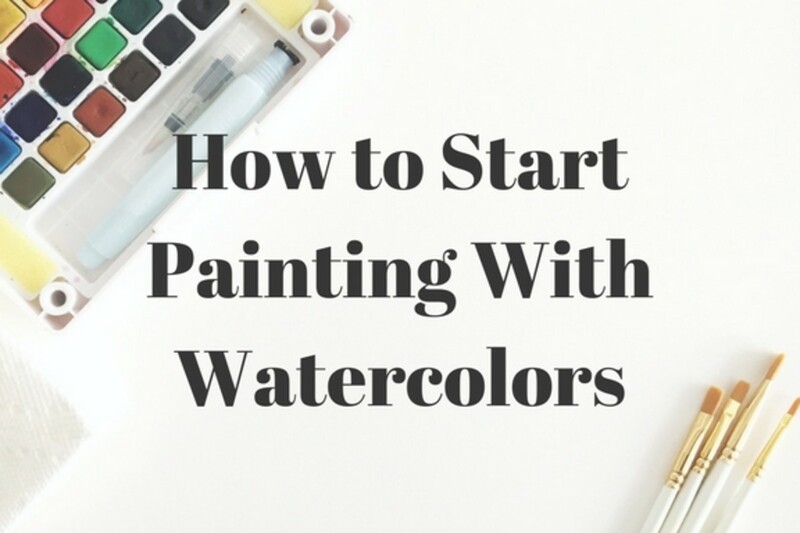 But, again, this article's aim is to get people started in watercolour without buying more than they initially might need to. I must stress, though, that this suggested selection is bound to be argued over by other artists! 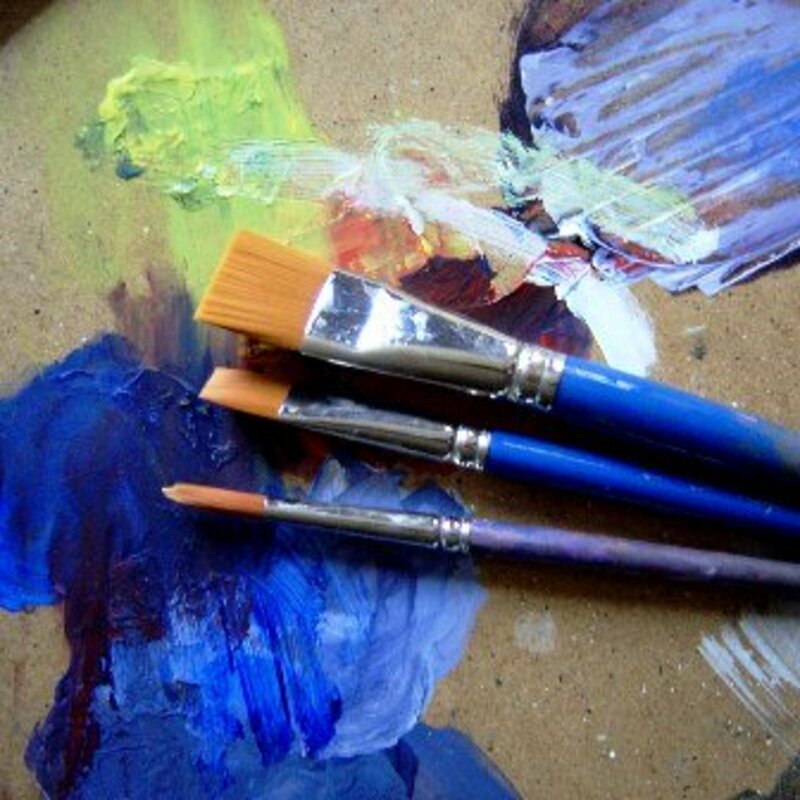 Over time, every artist develops their own palette of colours useful to them, and that is entirely to be expected. Feel free to share your own choice of colours for beginners, and your reasons for these, in the Comments section below. Which Quality of Watercolours should I Buy? I once overheard an art shop owner explain to a new staff member that artist quality paints are fine when a person's paintings start selling at over £1000. Until that time comes, if it ever does, student/hobbyist quality paints are absolutely fine and that most of her professional artist clients continue using them. 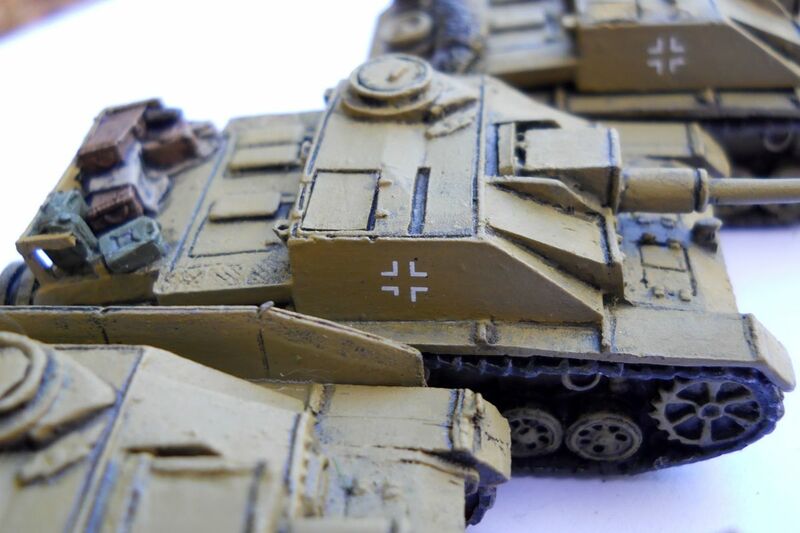 For beginners, student quality paints are the logical option. They are much more affordable than artist quality paints, and in recent years the purity of the colours and their permanency have been greatly improved. Indeed, many people couldn't even tell the difference between a work created with student quality paints and a work done with artists quality. Brands vary considerably between countries. If you're unsure of a brand name, ask the retailer for advice. 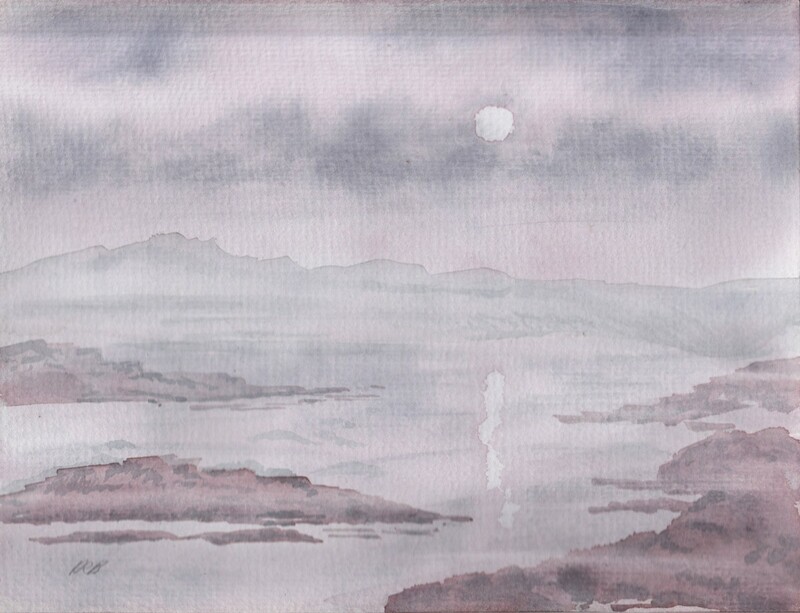 Very cheap watercolour paints can be hit and miss regards quality, and can consequently be a false economy. 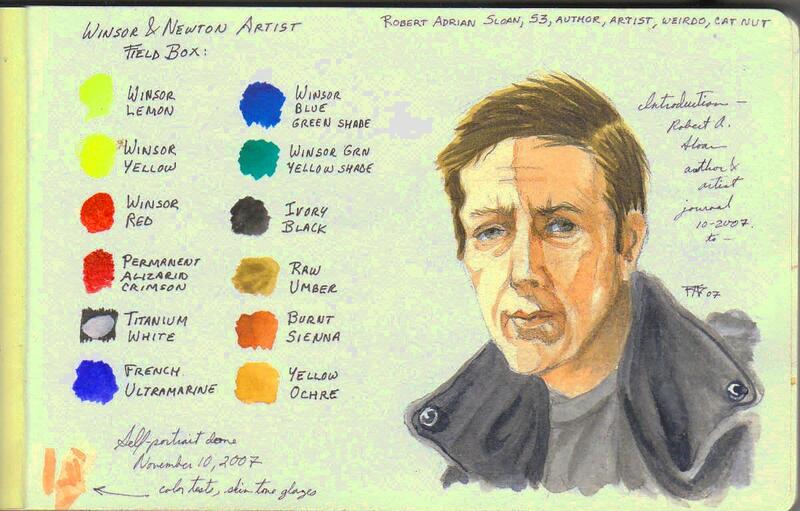 I use Winsor & Newton watercolour paints, which I've found to be of excellent quality. 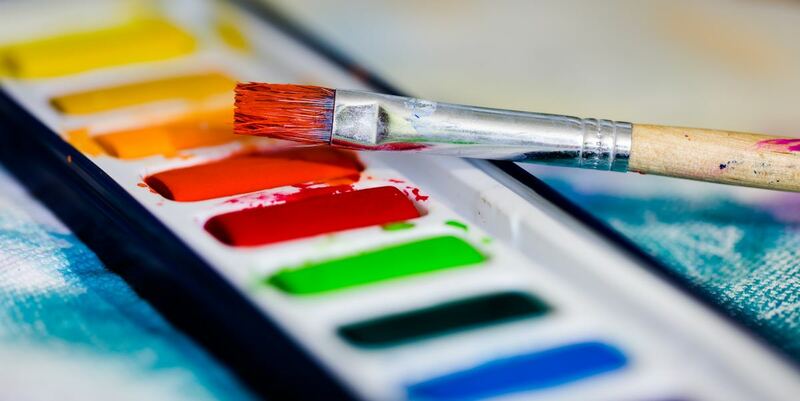 Money-Saving Alternatives for Art Equipment! Water container - an old jam or coffee jar will serve just as well. Paint palette - a plain white dinner plate or plastic tray, (possibly from a charity shop). Drawing board - I use discarded shelves from a neighbour's old kitchen cabinets. Hardboard off-cuts bought cheaply from your local DIY store will be fine, too. Art Box - before buying that fancy storage box in the art shop, visit your DIY store which will offer a very similar item for half the price. If you don't intend carrying your painting gear outdoors, then old shoe boxes are fine for storage. Spray Diffuser - try a plastic water spray intended for spraying plants! They're easier to use, too. Brush Holder - a clean plant pot or a child's plastic sandcastle bucket will serve equally as well. I stand my in-use brushes in a vintage pipe rack - bristles pointing up, of course! Artists work in a wide variety of spaces. Renting studio space is probably jumping the gun for many beginners, but here are three practical ideas which may help. I've met several artists who have converted their sheds into art studios. Temperature can be a drawback, however - freezing in winter and too hot at the height of summer. One lady positioned a plastic summer marquee in front of her shed door in order to increase the workspace. Another artist draped white cotton sheets just below the corrugated plastic roof of her shed to try to keep the temperature within tolerable levels - though she admitted that if it gets too hot, it's back to painting at the kitchen table! Another artist told me that the largely-unused spare bedroom proved too much of a temptation. She kept looking at it covetously and thinking how it seemed such a poor use of valuable space. It's now an art studio, and occasional guests have to lodge at the B&B nearby. Yet another artist turned the entire front room of the house into a beautiful and inspirational art studio, and what would have been purely a dining room now doubles as a living room. In the photo above, you can see my own art studio as it looks at the time of writing this - July 2018. Located in what would have been a bedroom, it feels wonderful to be able to wander into it at any time of the day or night and begin to create something. There's even a fleecy blanket on the floor, as my dogs like to keep me company! On the table you can see one of the repurposed kitchen cupboard shelves which I use as drawing boards. 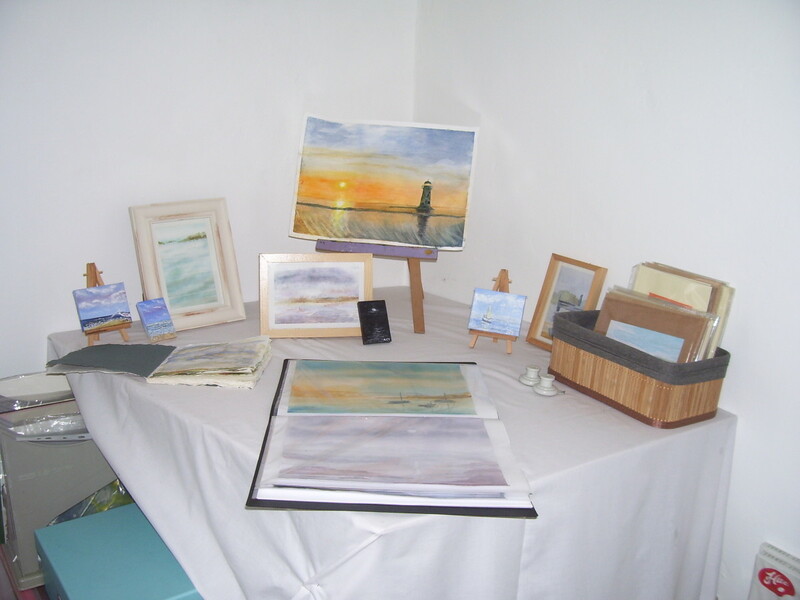 As I also paint in oils, you can see materials for this - such as the upright French easel, canvases stored under the table, and a glass jug full of bristle brushes. You can also see a desk-top easel and the vintage pipe rack used for holding brushes, mentioned earlier in this article. Embarking on any major domestic overhaul may well be out of the question for someone who is new to painting. Maybe there's simply not the space. 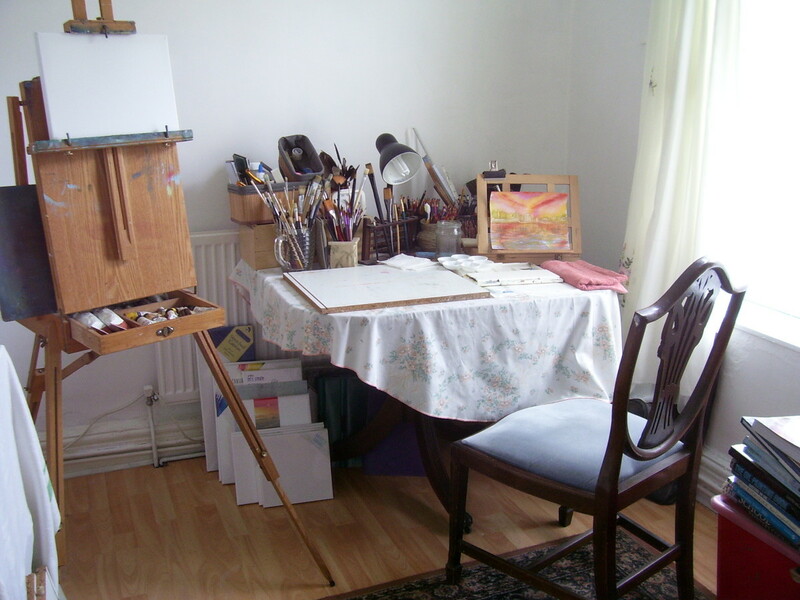 A table-top fold-away easel set up on the kitchen table will serve perfectly well; the only frustration will be having to tidy everything away again to make way for the next meal. Share your own ideas for workspaces in the Comments section below. So where are you going to keep your art gear? Recently, I overheard a conversation between two artists who were discussing their portfolio cases and how useful these were. "Oh, yes," said one lady earnestly, "which is why I bought one in every size!" What on earth for? All she needed to do is check the size of her largest drawing then select a portfolio case that this would fit into. As all the other drawings are smaller, they'd fit into it too. Still, I'm sure the art shop was grateful for her generosity. Portfolio cases can store a surprisingly large quantity of drawing and watercolour paintings. The downside is that paintings can potentially be damaged over time if surfaces rub together. However, I've successfully stored art in these cases for decades without any problems occurring. Sketchbooks tend to pile up over time. 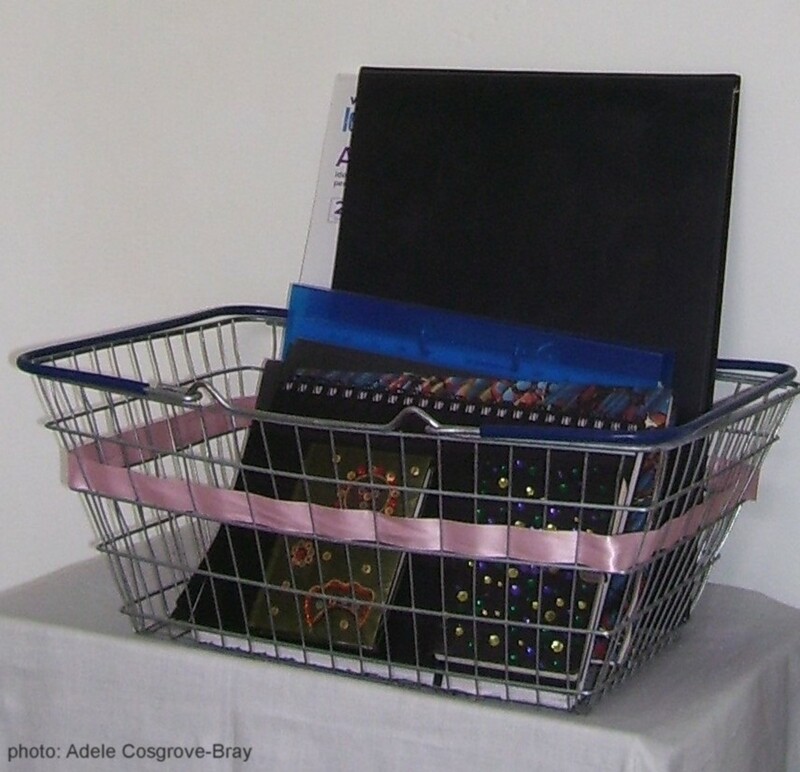 Be inventive with storage, as with my wire shopping basket, shown in the photo above. Repurposed wooden fruit/veg boxes can be fixed to walls as shelving. Crates of art books or old work can be stacked, then with a cloth thrown over them they'll make a useful display surface - as shown in another of my photos here. Avoid buying those arty-looking equipment boxes which art shops love to stock in towards Xmas or the start of a new academic year. All those little fold-away drawers with their tidy compartments are indeed an appealing and useful way of storing paints tubes, brushes and other materials, but if you call into a DIY store you will find very similar, if not identical, items at a fraction of the price. Please share your own art storage solutions in the Comments section below. Yes, it could help save a fortune on art materials! Yes, I found it interesting. No, I totally disagree with the author.